[03:43:57] <skunkworks_> sure. what is on the wheezy cd? [03:58:57] <skunkworks_> systems that run 50+us latency usually run a lot better - <20us when using 'idle=poll' in the kernel line..
[14:08:16] <jepler> Hopefully sourceforge gets a femtocent everytime it attaches a blurb about some proprietary software on our mailing list about free software. [14:08:46] <cradek> seb_kuzminsky: cool, will you also rebuild wlo/wheezy/2.6? [14:09:43] <JT-Shop> on the CD image can you turn off the OS updates prompt? [14:11:16] <skunkworks> I have not seen it with wheezy either..
[14:12:39] <JT-Shop> the next CD will not be Ubuntu? [14:13:26] <jepler> hah, in debian 7 "wheezy", synaptic settings > repositories > updates, an option has the title "Notify me of a new Ubuntu version"
[14:26:31] <cradek> jepler: I set those things in synaptic but nothing happens when I reboot. there must be another xfce piece of the puzzle. [14:27:45] <jepler> looks like gnome broke the update manager so that it doesn't work in xfce? [14:29:11] <jepler> do you still live in the fantasy land where it's possible to write an application like "show a list of available updates on the screen" that can work on more than one desktop environment? [14:32:42] <cradek> might work in wheezy? I installed update-notifier and am rebooting. [14:36:07] <jepler> just to list the updates? [14:37:37] <skunkworks> there isn't one? [14:38:33] <seb_kuzminsky> man the harpoons! [15:11:21] <maximilian_h> is anybody actually using this with a gantry ? [15:30:34] <seb_kuzminsky> sounds like a neat machine! [15:46:08] <cradek> you do realize F is in degrees/minute when you move only C axis, right? [15:48:11] <maximilian_h> hang on, can I copy&paste my c axis here ? [15:49:46] <skunkworks> seb_kuzminsky, so - what exactly do I need? [15:52:30] <jepler> seb_kuzminsky: is there a timestamp in hostmot2? 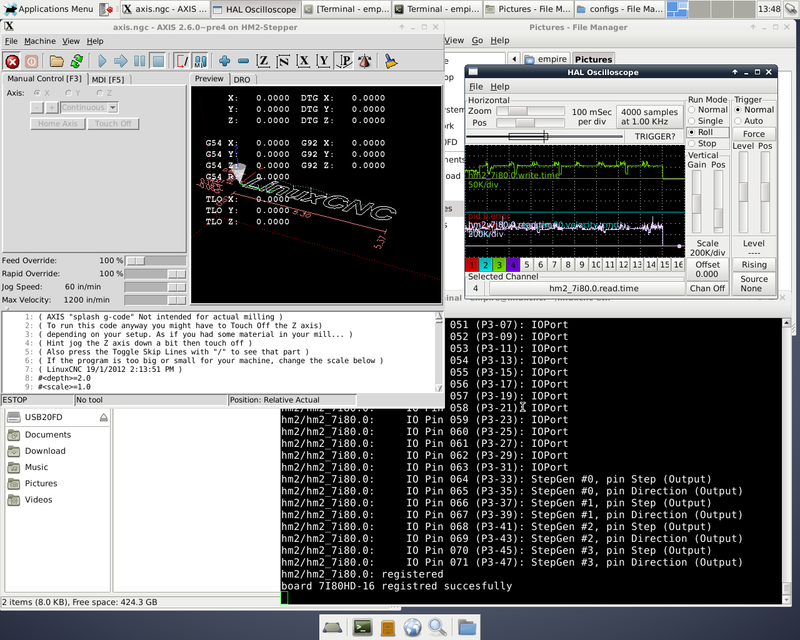 [15:54:15] <skunkworks> will the installed version of linuxcnc on the livecd work with the different kernel? [15:54:39] <jepler> seb_kuzminsky: Is there a free-running counter that counts up at a known speed? [15:55:07] <seb_kuzminsky> PCW: do you know of one? [15:55:10] <skunkworks> seb_kuzminsky, sure. ok.
[15:55:36] <seb_kuzminsky> maximilian_h: your C max vel is 660 degrees per minute, is that maybe the low speed you're seeing? [15:57:22] <seb_kuzminsky> doesn't the axis gui show vel in units/second mode, rather than units/minute? [16:08:09] <seb_kuzminsky> what does uname say with these rtai kernels? [16:10:22] <skunkworks> seb_kuzminsky, awesome ascii art! [16:17:37] <jepler> that's why I squashed all the uspace stuff to a single commit with the message "gmoppaco 1_5_37" and pushed it all to the 2.6 branch last night. [18:40:35] <skunkworks> labfiew is linux? [21:19:43] <seb_kuzminsky> i sent you the link, can you try it if possible & report back? [21:22:37] <dgarr> so i need to download a deb instead of using synaptic? [21:24:26] <seb_kuzminsky> what kernels do you have installed? look in /boot or "dpkg -l 'linux-image*' | grep ^ii"
[21:26:26] <seb_kuzminsky> you see the .96 ones? [21:28:50] <seb_kuzminsky> then say "apt-get install linux-image-3.4-9-rtai-686-pae=3.4.55-1linuxcnc"
[21:32:08] <dgarr> ok that started, will i need any other updates like headers to build linuxcnc? [21:32:44] <seb_kuzminsky> yes, although you can crash the machine by just running the rtai latency test, right? [21:49:04] <dgarr> tried both ways , still Invalid module format is a reboot required? [22:02:37] <jepler> hm, I seem to be hitting a bug. I wonder if it's uspace or hm2_eth. [22:03:48] <micges-dev> what board what bitfile? [22:06:00] <jepler> no sticker seems to identify the firmware. [22:14:46] <skunkworks_> jepler: you probably want to set the gpio as open collector..
[22:26:48] <jepler> Program received signal SIGSEGV, Segmentation fault. [22:28:42] <jepler> this happens just as it starts to print "IO Connections for P2"
[22:32:07] <micges-dev> jepler: what firmware version in ./mesaflash --device 7i80 --addr n.n.n.n --verbose ? [22:33:58] <jepler> thread order is pet / read / write -- is that OK? [22:35:40] <jepler> I've got a ribbon cable from 7i80 P2 to Mesa 7i31. I haven't touched voltage jumpers. [22:37:09] <jepler> PCW: running ubc3 hm2-eth or usapce hm2-eth? [22:47:05] <jepler> I'll troubleshoot further later. time to make dinner. [23:01:42] <seb_kuzminsky> and it didnt crash or anything? that's new right? [23:02:25] <seb_kuzminsky> your machine can run the 3.4.55-1linuxcnc ltency test, whereas it couldnt run the 3.4.87 or the 3.4.96 ones without crashing? [23:06:23] <seb_kuzminsky> you are 184.101.147.237, right? [23:08:28] <micges-dev> PCW: duplicated from jepler's setup? [23:21:32] <micges-dev> PCW: did you update any zip file with bitfiles with ICAP support? [23:28:38] <seb_kuzminsky> heh oh wait he's right, we're there! [23:45:18] <seb_kuzminsky> would you try 3.4.55-1linuxcnc and see if it's fixed? [23:45:49] <micges-dev> skunkworks_: on what system you have usb broken?